The UMC is Praying our Way Forward. Let’s enfold Michigan’s 2019 delegation in our daily devotions. United Methodists around the globe are now engaged in Phase 3 of the Praying our Way Forward effort. Phase 3 began June 3 and continues through the Special Session of the General Conference in February 2019. Every United Methodist is encouraged to pray for four minutes every day at 2:23-2:26 am or pm in their own time zone. That particular time was chosen because the 2019 General Conference will be in session February 23 through February 26. In addition, a weekly fast (from food, social media, email, or other daily activity) is suggested from Thursday after dinner to Friday mid-afternoon. Click here for a weekly calendar to help focus prayers. The delegates to the 2019 General Conference will be among those on the prayer calendar. Among them will be the Michigan Conference delegation. We list them here for additional prayer. They are listed in order of election. Note that Jurisdictional Conference clergy and lay delegates serve as alternates at General Conference. The West Michigan delegates were elected in 2014 for service at the 2016 General and Jurisdictional Conferences. 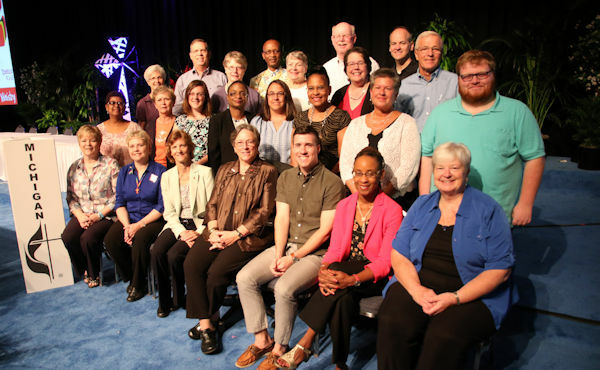 Detroit Conference delegates were elected in 2015 for similar service. Both Annual Conferences voted to have 2016 delegations serve at the Special Session next year. The Rev. Charles Boayue and Nichea Guy serve as co-chairs of the combined delegation. Nichea Guy explains that these delegates are currently designated “as elected by West Michigan Conference” and “as elected by Detroit Conference” but will be seated as a Michigan Delegation once in St. Louis. As they did in preparation for the 2016 General Conference, the delegations will be preparing for the 2019 Session together. They will meet twice (August and fall) with Bishop David Bard to walk through the process and issues The Council of Bishops engaged in while refining their recommendation to the Special Session. While it is known that The Council of Bishops recommends the One Church Model, specific legislation from them and from others will become public in July. Delegates will then receive details from the Commission on General Conference about the process and petitions coming before the body. Pastor Gerald M. Sever, Jr.